The episode opens in Polis where Lexa has gathered a council to oversee a hearing. Whose hearing? I wondered, too, until they brought a shackled Nia, the Queen of Azgeda, into the room. Me: How on earth did they capture her. Me: How did this happen. Me: They're going to tell us, right? Me: You don't just have a free, ruling Nia and then BOOM, a captured Nia without showing us how it was done. Except yes, that's exactly what happened. Nia is brought into the room with no explanation. Did she come willingly? It doesn't look like it. Was it a trap deliberately set by her? That would have been great, but no. It's just a regular hearing for a mysteriously captured queen. Nia proves defiant, telling Lexa she does not recognize Clarke as a legitimate ambassador, until Lexa informs Nia that Skykru and Trikru are now one. Nia then moves for a vote of no confidence, and every Clan ambassador votes to depose Lexa - except Clarke. Nia invokes a fight to the death, and Lexa accepts. Titus tells Lexa to choose someone to fight in her stead, but she insists on doing it herself. Clarke doubts the intelligence of this plan and tells Lexa, "I saw Roan kill three people in the time it took for the first body to hit the ground." ...which doesn't exactly go over the way they wanted it to. Clarke approaches Nia in her tent and offers to switch sides, even cutting her hand open like Azgeda vows require. But Nia's second, a girl who has been viewing Clarke with suspicion, runs forward just as Nia prepares to seal the deal and shows how Nia would have been poisoned had she gone through with it. Nia cuts open her second's hand and smears black blood over Clarke's face, then sends her back to Lexa as a warning. Lexa tells Clarke that Nia's second was a Nightblood, much like the children Lexa herself has been training. They carry black blood in their veins, and their heritage goes back to 'the beginning' (i.e. apparently, they're special). Clarke tells Lexa she won't attend the fight to the death, and they exchange a good-bye. 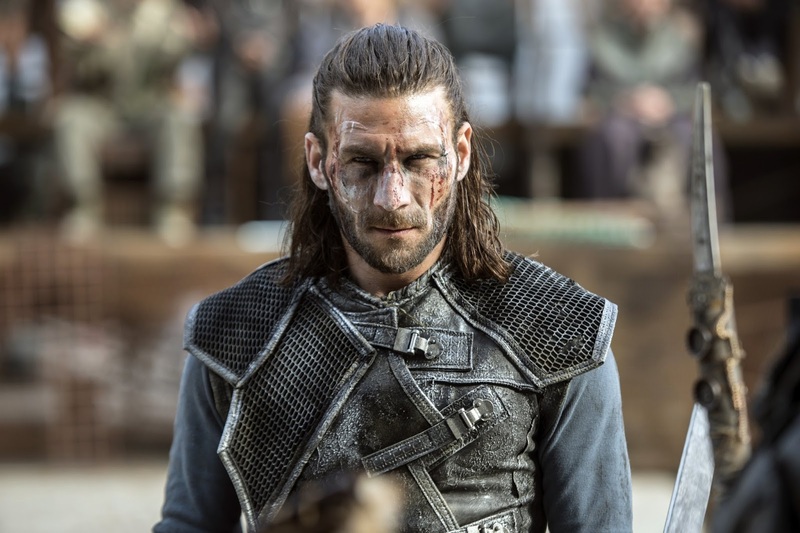 I have to give kudos to the fight scene between Roan and Lexa - the choreography and cinematography were impressive, and it's the best fight sequence we've had yet in the show. Lexa wins the fight. And I have to say, it looked a little too easy there at the end. She knocked Roan down, and yet it almost looked like he gave up. I don't know whether that was a glitch in the choreography because they ran out of good ideas or if it's to be addressed next episode. Nia, extremely unhappy with her son's loss, screams that if he dies now, he won't die a Prince of Azgeda - he'll just die a coward. Thanks again, Mom. Here we have a surprisingly good move on Lexa's part. She stands above Roan with her spear poised to kill him. "Blood must have blood," she says and throws the spear at Nia, killing the Queen of Azgeda instantly. "The Queen is dead," Lexa declares amid the shock. "Long live the King." Me: Okay. Rothenpill did good. Now please don't mess it up. Meanwhile, back at Arkadia, Bellamy is struggling with Gina's death. The memorial for those killed at Mount Weather is interrupted as angry Farm Station soldiers, upon discovering Lexa's protective army camped outside, attack Lincoln. Pike and Kane settle things down temporarily, and Lincoln does not press charges, but the Farm Station newcomers are furious at the 'threat' outside their walls. Kane and Abby reassure everyone that the soldiers are under Indra's command and are a peacekeeping force only, but Pike and Farm Station view it as a trap. Pike preys on Bellamy's wounded vulnerability and forms a bond with him before asking Bellamy to acquire ten guns so they can go kill all the Grounders. Me: Don't even think about it. Me: Your freckles and your puppy dog eyes cannot save you, Bellamy. Pike and his small army sneak toward the gates at night, armed and ready, but Lincoln and Octavia bar the way and raise the alarm. Kane shows up, and Pike tells his men to lower the guns peacefully, but Kane has them locked until further notice. As Bellamy is taken away, he starts to raise a chant - "Pike! Pike! Pike!" - and everyone joins in. MUCH TO EVERYONE'S SURPRISE (Read: we saw this coming from three hundred miles away), Pike is voted Chancellor the next morning, and Kane relinquishes his command. While this is happening, Monty and Jasper take a very uncomfortable and emotionally painful trip to Dropship where Jasper drinks alcohol and is bitter, and Monty - very Not Okay with the fact Jasper is walking around with Finn's ashes in a jar - gives him the lecture he deserves and leaves. Jasper spills Finn's ashes accidentally and cries. Ack. We've known since the first S3 promo aired that Bellamy would have a difficult time this season (because the last two have been so easy on him, ahahahaha). But my biggest beef is the way he's being written. Everything about Arkadia this episode was rushed, especially where Bellamy is concerned. At the start of the season, he's searching for Clarke alongside Indra, and now, within the span of four episodes, he's supposedly Anti-Grounder (be they friend or foe) and perfectly okay with gunning three hundred of their allies down. This is horrible, horrible writing. This is the kind of character change that needs to take place over an entire season - not over four episodes. It makes Bellamy look weak, which he is not; and it makes him look stupid, which he is not. It's wrecking all his previous character development because they're rushing the story line, and I'm not okay with it. Usually, my biggest beef with the show is Clarke but not this time. This time it's Bellamy, and the way he's being forced into a place that does not suit him. It could possibly suit him in say, season four, IF you spent ALL of season three DEVELOPING this side of him. But that didn't happen. So, looking at Jason Rothenpill, I move for a vote of no confidence. Do you like the direction the show is heading, or are you concerned (like me)? *chants* No Heda No Mo. Get Rothenpill out of the Heda chair.